The Super Bowl, one of the most anticipated sporting events of the year is finally over, with the Philadelphia Eagles winning their first Super Bowl title. While the Eagles and Patriots battled on the field, a bigger battle was fought for your attention by brands and sponsors on television and social media. Brands such as Tide with their Everything is a #TideAd campaign, NFL’s Touchdowns to come featuring the New York Giants and PepsiCo’s Rap battle between its two brands — Doritos and Mountain Dew, emerged as the clear winners on television. Let’s look at teams, athletes and brands who stole the spotlight and won big on social media sponsorship during the Super Bowl weekend. New England Patriots — Stepping into their 10th Super Bowl, the Patriots failed to defend their Super Bowl title and lost to the Philadelphia Eagles. However, the Patriots are a dominant force off the field with a committed fan base of over 14.2M followers across their social channels (Facebook, Twitter & Instagram). During the Super Bowl weekend, they drove 26% more engagements with their followers than the Eagles. Philadelphia Eagles — Despite losing their star quarterback to an injury and widely considered the underdogs during the playoffs, the Eagles won their first ever Super Bowl title this year. Throughout Super Bowl weekend, the Eagles added 73k more new followers than the Patriots to a total of 7.5M followers across their social channels.Clearly, the Eagles are the underdogs off the field, however, with the Super Bowl win, sponsor brands can capitalize on the fan engagement with the champions. 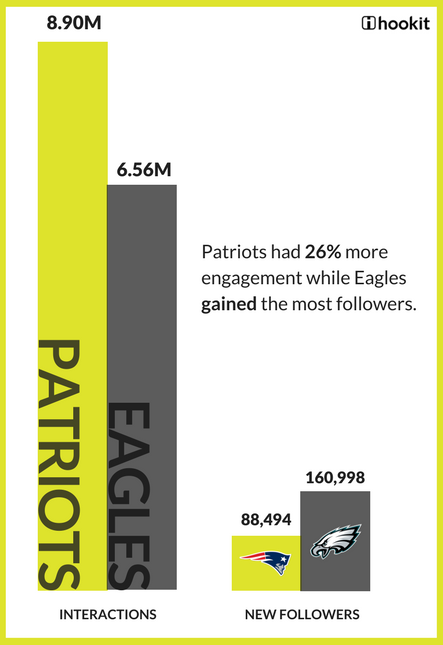 Though the Eagles added more new followers during the Super Bowl, the Patriots drove 26% more engagement with their followers and have a higher potential reach due to their larger & expanding social media base. Tom Brady — The NFL league MVP of 2018 was one of the most engaged athletes on social media during Super Bowl weekend. With 8.2M followers across his social channels (Facebook & Instagram, Brady does not have a Twitter account), he had a total of 2.7M interactions and gained 208k new followers during the Super Bowl weekend. Additionally, throughout this time, he drove 2x more interactions with his followers than the top 5 Eagles’ athletes COMBINED. He also gained more new followers than the combined total of the top 5 Eagles’ athletes, cementing his place as the MVP on social media. Carson Wentz — Even with his injury and unable to play at the Super Bowl, star quarterback Wentz was the most engaged athlete on social media for the Eagles. He had the most engagement with his followers with 435k interactions. However, Eagles’ tight end Zach Ertz, gained more new followers (69k) on social media during the Super Bowl weekend. Tom Brady may have lost his chance at another Super Bowl ring this year, but he scored big and won on Social Media with increased fan engagement and addition of new followers to his already sizable social media base. Also, his Facebook & Instagram post leading up to the Super Bowl gained more than 1.4M interactions — the highest ever by an individual athlete during the Super Bowl weekend. These interactions are one of the vital reasons why brands sponsor top athletes like Tom Brady to promote their products. 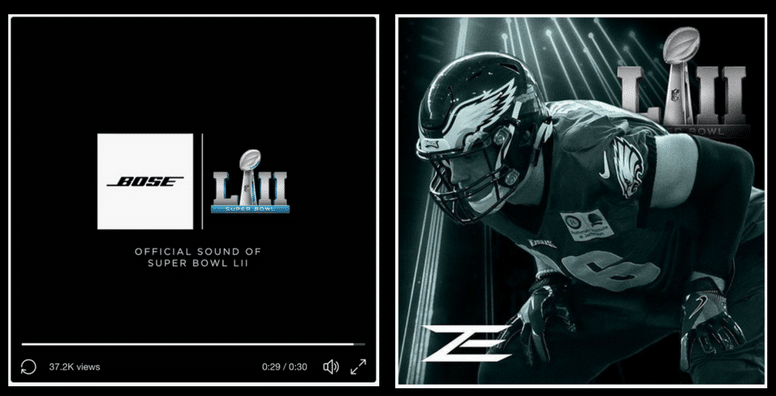 While the New England Patriots did not actively promote any of their sponsors on social media during Super Bowl weekend, the Philadelphia Eagles’ promotion of their sponsor Axalta Coating Systems on social media earned a media value of $3k while their promotion of Bose over their social channels earned a media value of over $201k. Patriots’ wide receiver Julian Edelman’s social media promotion of Duracell batteries earned a media value of $5k and Zach Ertz of the Eagles promoted Nike earning Nike a media value of $29k. Bose — the official sound of the NFL, had already earned a media value of more than $537k from social media posts by athletes and teams during the playoffs. Now, it has also won the highest earned media value ($201k) on social media during Super Bowl weekend due to its sponsorships. Zach Ertz has consistently promoted his brand sponsors on social media throughout the playoffs and during the Super Bowl and has contributed a total earned media value of more than $298k to his sponsors Bose, Lincoln Financial Field & Nike. NFL’s Touchdowns to come was one of the most popular ads on Television and Social Media during the Super Bowl. The commercial featuring Odell Beckham Jr. and Eli Manning of the New York Giants won Social Media with a whopping 17M interactions. 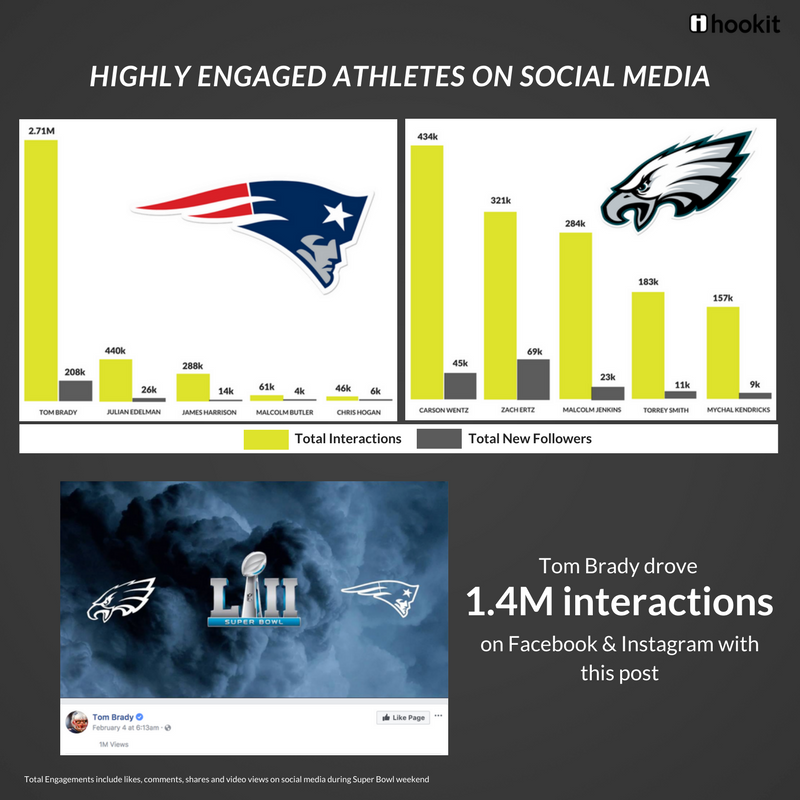 In comparison, the New England Patriots had 2.14M interactions and the Philadelphia Eagles had 301k interactions from their social media posts. Unsurprisingly, the most popular hashtag during the Super Bowl weekend was #superbowl. It was used by 95,260 people 129,223 times and had 18.2M interactions. Many brands and athletes used this hashtag to draw attention to their sponsors and help them earn media value. 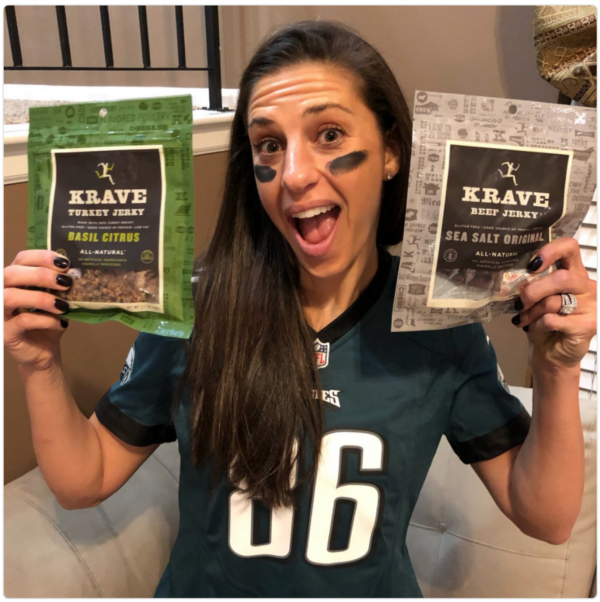 Chief among them was American Soccer player Carli Lloyd, who used the #superbowl hashtag to drive an earned media value of $65k to her sponsor KraveJerky. Her post using #superbowl received over 45k interactions across her social media platforms. With viewing patterns being disrupted by second screens, it is essential to not just measure a brand or sponsor’s impact on television alone. Sports fans also use social platforms throughout the game to interact, support and celebrate with their teams. By measuring the engagement with sports fans on both social media and traditional channels, brands and sponsors can determine the total value of their sponsorships, gain a holistic picture to make better data driven decisions and emerge the Social Media Sponsorship Champions. Who was your favorite athlete or brand on Super Bowl? Are brands using social media correctly? Let us know in the comments below!! 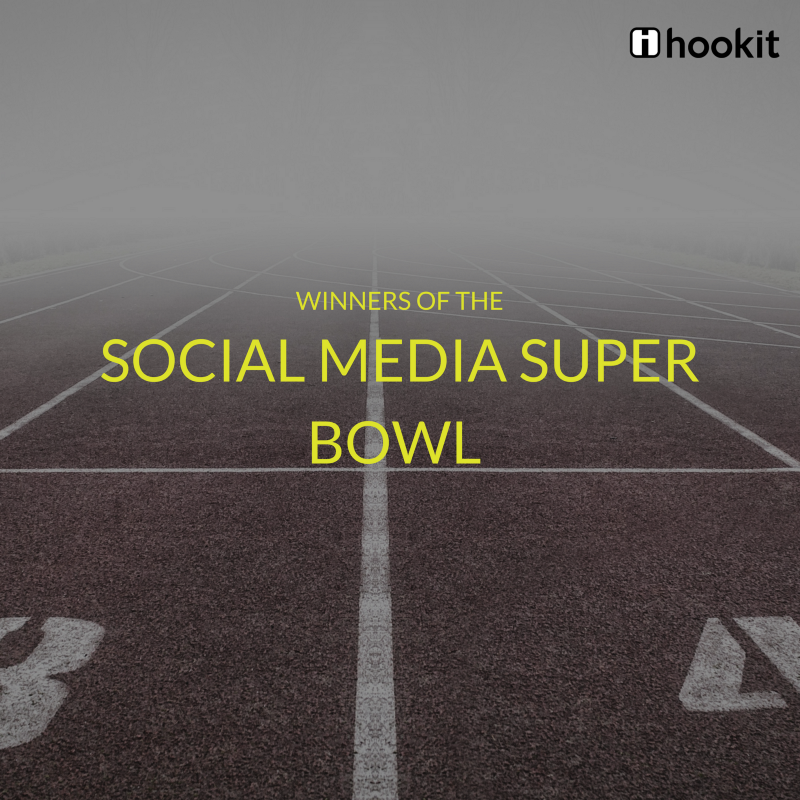 Hookit is the market leader of sponsorship analytics and valuation of social and digital media for sports. It developed the first, most trusted platform in the global marketplace that effectively measures previously unknown sponsorship value that brands receive from athletes, teams, leagues, venues and events in social and digital media. Hookit aggregates billions of data points from social and digital platforms and uses spontech to provide real-time insights and valuations for brands and properties to quantify and maximize sports sponsorships. LEARN MORE about how Hookit can help you power your sponsorship intelligence.